Yellow (white in colour) Frosty, also having a champion sire. At 3 years old, Frosty is all enthusiasm! She is very calm, and loves hanging out with us and with our other two dogs. We are so glad she is in our family!! Otis (our foster male) lives with a family who has five children; he is very calm and easy going. Otis is a well behaved, obedient guy! Chica was our “oops , change of plans puppy”. 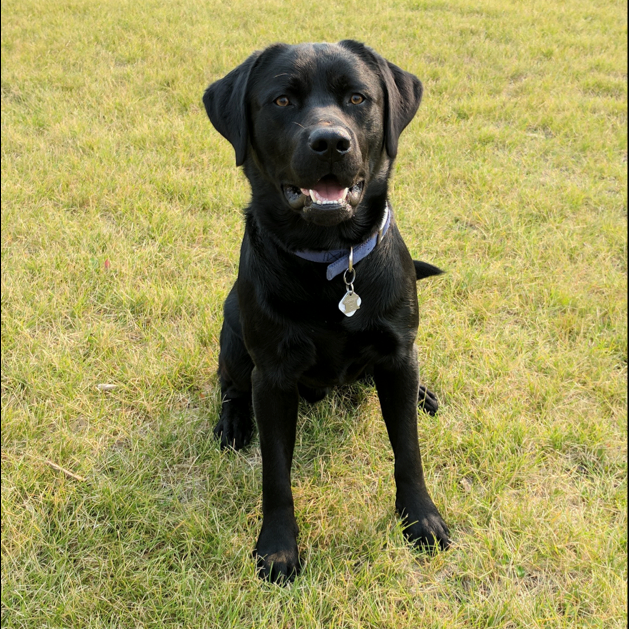 We had set our sights on more white labs as we located a breeder with similar standards as we have for DNA health testing and champion pedigrees. We were ready to order our next white lab when an international champion show breeder and geneticist offered one of his chocolate puppies to us. What could we do?! Chica joined the family. Calm, English in build, always running at the back of the pack with her short little legs, but enthusiastically jumping into the water first (and head first! ), Chica is all heart. Calm loving, and loyal, that is our Chica. -Cotton is the leader of the pack at JC's. She is smart, obedient and agile. She loves being around people and is excellent with young children. She is small in stature, but not character. Cotton loves chasing birds, swimming, and "tummy rubs" while chilling at our feet. Cotton would do well in search and rescue or agility training. Cotton's sire is a champion show dog. Thea is a quiet, calm, American x English lab. She has the best of both lines! Intelligent and agile, Thea is loyal and wants to please. She is our first “foster dog” who lives with her family elsewhere. We look forward to many visits from Thea and her family! Thea's beautiful black 2016 puppies are featured on our web site. Blitzen lives at our friend’s kennel and is a yellow English male lab, who they call their “angel dog” due to the calming affect he has on children. Blitzen is very friendly and loyal and an all around beautiful dog.